JohnnieFromTheBlog – Beats Studio by Dr. Dre, as good as they say? If you’re into music, hi-fi and more specific, head-fi you have most likely heard about these headphones. 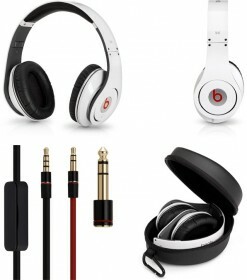 I’m talking about the Monster Beats Studio by Dr. Dre which is probably the most talked about headphones on the market. Some call them a hype while others compare them to Reference models from such as Sennheiser, Sure, Koss, Audio Technica and others. So, are they really as good as they say? Even though the price at this time has gone down from around €375 euro to €275 euro, the price tag will still scare away most of the casual €39 euro headphones buyers. Once you get past all the regrets that the price tag generates (unless you get them as a birthday present, yay! ), The Monster Beats Studio by Dr. Dre (from now on referred to as “The Beats”) are absolutely fantastic! Yes they are expensive but they are well worth it. The model is called “Studio” but are they really studio grade headphones? To be honest, no, maybe they are not. The Beats should be placed in the “Street wear headphones” category in my opinion, and in that segment they’re on the top. The Beats perform amazingly well and deliver a huge and convincing sound stage. The sound gives a very linear and exact impression, though with a slight bump in the lower frequencies but without getting sloppy. Most impressive is the incredible authority and bass response which The Beats perform with. The build quality and durability is really nice and they have a comfortable fit. The cord is detachable and The Beats come with two different cords in the package which are one standard and one iPhone / iPod edition cable with microphone and remote control. They also come with a very sturdy case to store them in while they’re in your backpack or something like that. The only thing that I really can complain on is that they “leak out” sound a lot and that may be a problem in some cases, like in a library or a silent coupé on the train. The original color The Beats first was released in is black with red details and later a white edition was released. Now you can get them in basically any color in any combination you like with a complete custom look from this website: http://www.colorwarepc.com/p-188-beats-studio.aspx I have the white edition which I personally think is totally awesome looking! Overall The Beats are great! They look nice, they sound good, and at least for my taste and compared to what headphones I have tried so far these are definitely my favorites! I like this blog. It has the rich and colorful content. It can give me many what I want. The style is so new and diverse, will always bring me more surprise. I think now I can not do without it. Thank you! Awesome! Thank you kindly for that!